My new occupation is waiting. Not waiting on tables, although I’ve done that and despite multiple beers spilled on customer’s heads and forgotten entrees, it was one of my most enjoyable jobs. But my method of employment currently is waiting as in pacing back and forth, peering out the window, marking time with crosshatches on the wall. 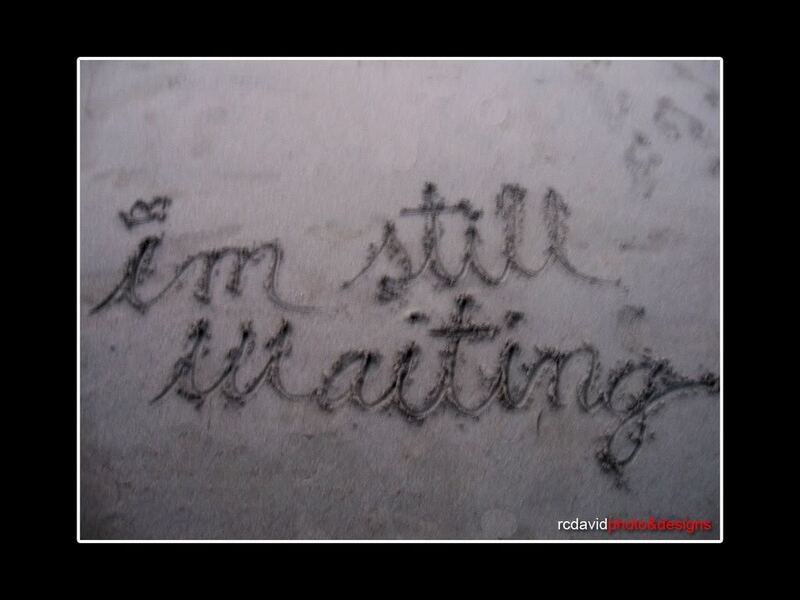 Waiting used to be simpler. There was a predetermined end date and if I could just last then all was well in the world. I would play tricks with myself: “tomorrow I can say that tomorrow I can say that tomorrow I can say that tomorrow is my birthday.” Somehow, if I only had to think as far as tomorrow, the waiting seemed more manageable. But the most trusted method to survive the wait was the paper chain. Usually viewed in elementary school classrooms or around a Christmas tree, I made paper chains to symbolize days. My grandparents were coming to visit in 25 days –then there was a chain with a paper loop for each day until they came and the highlight of the morning was tearing off that last loop, knowing that in exchange for the loop I got six months of time being showered with love. Seeing as how helpful this game was for me, I expected others to comply as well, picturing friends and relatives with rooms strung with paper chains until they came to see me or went off to camp or made it to the work deadline. Still, it was simple. There was a last loop day – a clear cut ending to cap anticipation. I do well with such black and white parameters. 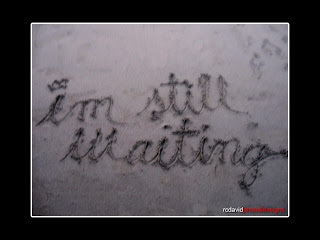 Lately, it seems as if waiting has slipped into a different dimension. I find it’s the word at the tip of my tongue to describe my life. And it flaps in the wind, acquiring new definitions, new angles, sneaking in to corners of my world and hijacking the boundaries of expectations. There are all types of waiting: Waiting at a red light. Waiting for a phone call. Waiting for medical results. Waiting with excitement, nose pressed against the window, scanning the horizon for the car that will carry my mom, friend, and puppy to come for a visit. There’s waiting for the new book to arrive at the library, waiting to start the book in an attempt to save up the joy. The wait that we cultivate, floating in the bliss of anticipation just as much as the finale. I wait for the paint to dry, wait for the flower to bloom, wait for the sun to emerge as victor. There’s aimless waiting, the amorphous hours in the day spent cleaning, reading, writing, pacing; glancing at the clock and wondering just how you might fill the time until sleep beckons. I wait when I arrive too early for a meeting, attempting to pass minutes by wandering around some shop until I realize that now I’ve lost track of time and am late. I wait to hear from publishers and literary agents, both of whom have no obligation to get back to me, but I open the mailbox still hopeful, channeling optimism as if to magically create an offer sealed with a stamp. I anticipate waiting, planning ahead which books to bring, which project to work on so as to manage the time. And then there’s the PhD waiting. The foggy delay toward a destination unknown. I wait for a sign, the universal omen to guide me forward on a life path. I wait for the hallway to end, for the door to open in a foreign land. Presented with a decision, any choice, I wait to arrive at the perfect answer. I catalogue pros and cons, I debate in my head, I weight out the risks. I choose one and then the other, probing for the right decision, forgetting that any important decision comes with pain on both sides, and in trying to figure out how to avoid pain for all parties involved, I become paralyzed. 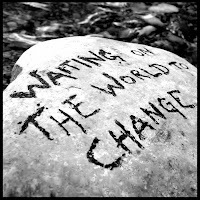 Usually, the outcome of paralysis is that no choice becomes the choice, the election of the status quo; the status quo of no action translating into action. There’s waiting where I don’t even know what I'm waiting for, hoping for – having learned that sometimes the best blessings are the ones you didn’t know you were missing, the ones you didn’t even know to wish for. I wait to take risks, brainwashing with a mantra of: I’ll be ready to do that when I get older, more financially secure, married, divorced, am dating, have broken up. I’ll change when I have more friends, have a better job, am less anxious, have lost weight, have gained weight, have found the perfect lampshade. I’ll be ready when I own a house, pay off school loans, graduate, move, when I figure out my life’s purpose. These are the waits that are chosen, selected, volunteered for as I put off my dreams, falling prey to the lie that there will be a perfect time, a better time to brush off and do what’s scary. I am not an A+ waiter. I excel with deadlines and promised arrivals. I like to plan, to organize, to sort through the craziness with the knowledge that an ending is in sight. I polish my lists and circle the due dates, secure in the order of it all. And so it’s not surprising that my days are filled with waiting right now, the kind that can drag on and disappear over the hill, leaving me in the dark about how long my paper chain needs to be. Right now, I’ll choose to see it as a gift, an opportunity to hone a new skill, to nurture the ability to sit in the silence and appreciate it rather than wishing it away. Tomorrow, I may only be able to see the seconds piling up, empty moments testing my staying power. But for today, I can accept the wait, eager to discover what the pot at the end of the rainbow will contain. And in the meantime, I’ll perch by the window, willing the car to come around the bend; checking my watch as if that will propel the vehicle bringing me puppy kisses, a mother’s hugs, and a friend’s easy smile. so i hope the wait for the puppy kisses was worthwhile!! this was fabulous. you're ability to help us feel how the waiting feels is amazing. and that waiting for something you're not even sure is there is something we all can relate to... what's next??? who knows! good luck with Gracie Joy!